After a concert is always a busy time for music teachers, almost as busy as getting ready for the concert itself. Carlos Armao knows all about it. He is the director of the Sistema NB classical music training centre in Miramichi. After the concert on March 16 at King Street Elementary School, Armao was greeted by parents telling him how good the band sounded. Sistema NB currently has approximately 74 kids from the Miramichi area enrolled in the program. Armao said he’s seen firsthand the impact the program has had on these children and it amazes him every single day. Armao was born in Venezuela, he started playing music with the local El Sistema centre. In 2014, he graduated from McGill University and in January 2016 became the director of the Miramichi Sistema centre. He is one of three instructors based in Miramichi, with classically trained musicians Emily Field and Adora Wong also on staff. Sistema teaches kids to work together, which is important in an orchestra and in life, said Armao. 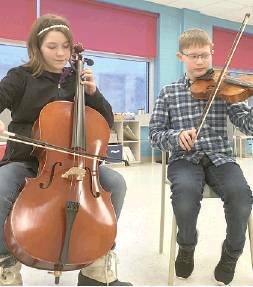 Caden Buckley is a viola with Sistema NB Miramichi. Armao is a great teacher, said Buckley. For Armao, seeing how children like Buckley have progressed always puts a smile on his face. With the progress, Armao hopes to see kids make it to the next level.